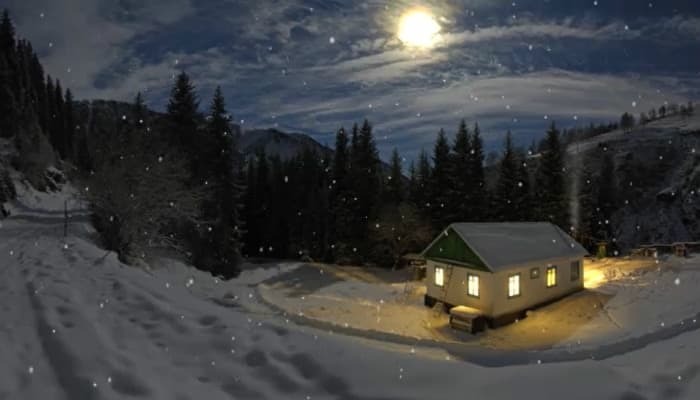 This enchanting image of a warm cosy holiday cabin somewhere captures your imagination. You can almost imagine the log fire burning inside with marshmallows on sticks at the ready, waiting to be toasted! You can hear children laughing and dancing in excitement for Father Christmas coming. Delicious Christmas holiday season smells of mulled wine, cinnamon and fresh pine fill the air. You almost want to rub your hands together to protect them from the winter frost and feel the warmth of the cabin embrace you as you enter. The holiday ecards for business pull you into a world of winter wonderland magic! The stunning night sky is lit by a full moon, catching the image of tall pine trees surrounding the cabin, so you get the feel of the cabin being high up in the mountains. The ecards look all the more magical when played, as the soft snow falls as your message appears and gentle festive music is played. This will without doubt put your clients in the festive mood this holiday season, so be sure to look at our website and design your card today! Your electronic Christmas cards for business will be sure to make a lasting impression with Ecard Shack, so take the opportunity to register an account and create as many designs as you like.